With an increase of school-based violence taking place nationally during recent years, it’s crucial to know what can be done in the case of an emergency school lock down. According to one recent survey taken, more than 20 states now require emergency drills dealing with lock downs and 30 more states have even more comprehensive plans in place to deal with emergency situations of most every nature. This article addresses the crucial school lock down procedures concerning the school/staff, parents and the students as well. One common problem triggered when a school has fire or lock down drills is that some people, including students, fail to take them seriously enough. Time is of the essence. Locking a classroom and going to a prearranged windowless place for hiding may be more difficult in an actual emergency; however, with planned escape routes and hiding places sufficiently rehearsed, lives will be saved in the case of a real lock down. Equally crucial is silently keeping out of sight of threatening danger and drawing no attention to where a teacher’s students are hiding until they can be rescued. Furthermore, if placing a phone call is impossible, having a predetermined code to text to a designated phone number proves to be a vital security measure during a lock down situation. As a rule, having lock down drills every four to six months is now mandatory for many schools. Moreover, school districts and principals would benefit greatly if they had the services of a professional security force working hand-in hand with the local police. Such a security firm could come to the school and evaluate that school’s lock down strategy well before a real disaster takes place. While it’s good for a school to provide security measures, parents on the home front need to take the following precautions with the children. A survival backpack with a cell phone or texting device and other items could very easily offer a way to sustain a student and other students in a lock down emergency. A good, reputable online survival website is one place to start for school emergency resources. Some typical items to include in a Classroom/Teacher kit are a cell phone, water pouches, wet wipes, an energy bar, some bandages, leather palm gloves and a flashlight. Student emergency kits offer a couple of days of needed necessities that help make a lock down situation a somewhat less stressful experience. 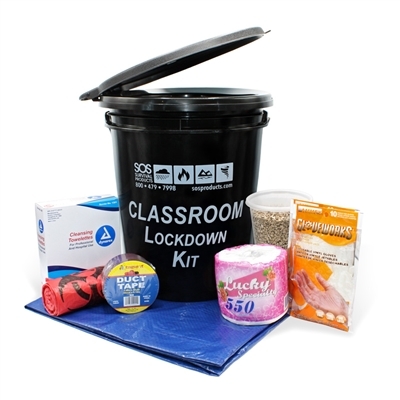 Our Classroom Lockdown Kit contains items for sanitation as well. Lastly, a list of predetermined family gathering places and phone numbers of friends, relatives and local hospitals adds a measure of safety to this scenario. In today’s unpredictable world, some peace of mind is still possible by planning ahead for many emergencies. Consequently, a combined effort of precautionary measures by law enforcement officials, school authorities and parents, acts as a three-strand cord of preparedness.